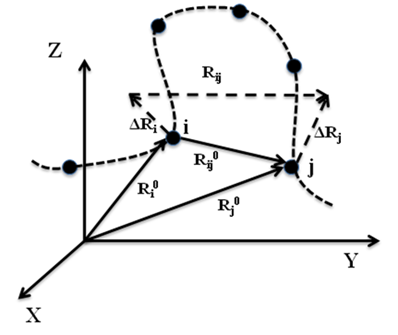 Figure 1: Schematic representation of equilibrium position vectors of residues, their distance vectors and fluctuations. where the summation is performed over all off-diagonal elements in the ith row (or column); h(x) is the Heaviside step function equal to 1 if the argument is positive, zero otherwise; ΔR is an N-dimensional vector composed of the fluctuations of the N-residues. where Γ-1ij is the ijth element of the pseudoinverse of Γ, V is the GNM potential given by Eq. 2. Therefore the evaluation of cross-correlations reduces to that of the ijth element of the inverse of Γ. The determinant of Γ is 0, and hence Γ-1 cannot be calculated directly. Instead, it is found from the eigenvalue decomposition Γ = ULUT which results in an ensemble of N-1 independent modes. U is the orthogonal matrix whose kth column uk is the kth eigenvector of Γ, and L is the diagonal matrix of eigenvalues lk which are usually organized in ascending order. One of the eigenvalues is identically zero, and the remaining N-1 eigenvalues define each the frequency of the N-1 GNM modes. The ith element (uk)i of uk describes the motion of the ith residue along the kth normal mode coordinate; or, the elements of the kth eigenvector uk represent the distribution of residue displacements (normalized over all residues) along the kth mode axis, and the corresponding eigenvalue lk scales with the frequency of the mode. The size of the motion along the kth mode scales with (1/lk)1/2. Thus (1/lk)1/2 serves as the ‘weight’ of a displacement along mode k. Clearly the lowest frequency modes (small lk) also called slowest modes or softest modes make the largest contribution to the overall motion. The mean-square fluctuations of residue i in mode k can be evaluated from Eq. 6 by replacing j by i. The plot of tr[uk ukT] as a function of residue i represents the probability distribution of residue square fluctuations in mode k, also called kth mode profile. Cij (n) varies in the range [-1, 1] and provides information on orientational correlations between the motions of residues i and j. For more information see references (2-7) listed below. The degree of collectivity of a given mode measures the extent to which the structural elements move together in that particular mode. A high degree of collectivity means a highly cooperative mode, that engages a large portion of (if not the entire) structure. Conversely, low collectivity refers to modes that affect small/local regions only. Modes of high degree of collectivity are generally of interest as functionally relevant modes. These are usually found at the low frequency end of the mode spectrum. where, k is the mode number, and i is the residue index. 1. Flory,P. (1976) Statistical thermodynamics of random networks. Proc. R. Soc. Lond. A, 351, 351-380. 2. Bahar,I., Atilgan,A.R. and Erman,B. (1997) Direct evaluation of thermal fluctuations in proteins using a single-parameter harmonic potential. Fold. Des., 2, 173-181. 3. Bahar,I., Atilgan,A.R., Demirel,M.C. and Erman,B. (1998) Vibrational Dynamics of Folded Proteins: Significance of Slow and Fast Motions in Relation to Function and Stability. Phys. Rev. Lett., 80, 23. 4. Bahar,I. and Rader,A.J. (2005) Coarse-grained normal mode analysis in structural biology. Curr. Opin. Struct. Biol., 15, 586-592. 5. Rader,A.J., Chennubhotla,C., Yang,L.W. and Bahar,I. (2006) The Gaussian network model: Theory and applications. In Bahar,I. and Cui,Q. (eds. ), NORMAL MODE ANALYSIS: THEORY AND APPLICATIONS TO BIOLOGICAL AND CHEMICAL SYSTEMS. Chapman & Hall/CRC: Boca Raton, FL, pp. 41-64. 6. Eyal,E., Dutta,A. and Bahar,I. (2011) Cooperative dynamics of proteins unraveled by network models. WIREs Comput Mol Sci, 1, 426-439. 7. Yang,L.W. (2011) Models with energy penalty on interresidue rotation address insufficiencies of conventional elastic network models. Biophys. J., 100, 1784-1793. 8. Brüschweiler,R. (1995) Collective protein dynamics and nuclear spin relaxation. J. Chem. Phys., 102, 3396-3403.